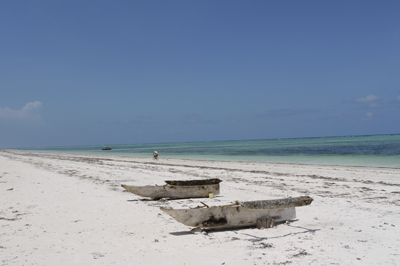 Even if guidebooks write differently, you can travel to Zanzibar all-year-round and you will find a never ending summertime. The air temperature is - even at night - always above 20 ° C and the water temperature of the Indian Ocean fluctuates between 25 ° and 28 ° C.
As the island is located close to the equator, the climate is tropical affected by the monsoon winds. The northern monsoon (Kaskazi) lasts three to four months from December to March involving a rise of temperatures to over 30° - 35°C. At this time, it is most comfortable at the seashore because there is often a light breeze. The south west monsoon (Kusi) lasts from April to November. It brings the rainy season (Masika), which starts in March or April and lasts until end of May. The rain is not comparable to the rain you know from your home country. Sometimes there is heavy rainfall for some hours, but shortly after the sun is shining again. Since the equator is nearby sunshine is very intense and there is a real danger of sunburn even after short unprotected exposure to the sun. Therfore it is important, to protect yourself against the sun including using a potent sun-blocker. For beach walks a head coverage is meaningful. In the evening the temperature is mostly pleasant, but sometimes it is a bit windy, so the taking along of a thin sweater is appropriate. 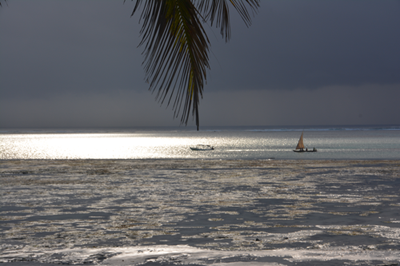 During the rainy season not so many tourists come to Zanzibar and this makes life on the island more calm and you get special offers everywhere. June to October is the dry season and temperatures go down to 25° - 28°C. This is the most comfortable travelling time. Sometimes there are short rains known as Vuli, but mostly the sun is shining. In November there is a short rainy season, but with less rain than in April or May.